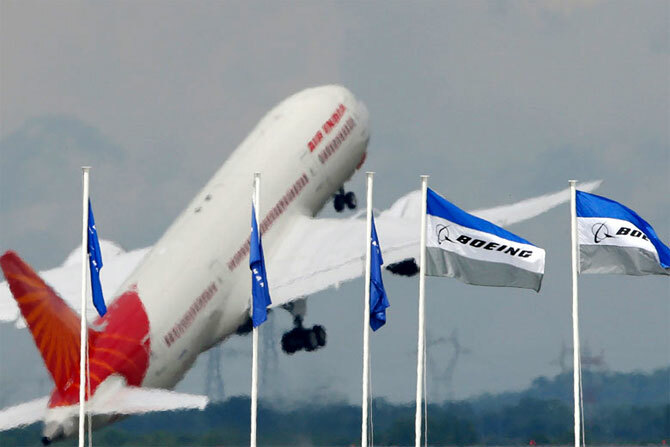 US aircraft maker Boeing will deliver two Dreamliners to Air India this year and four more next year to complete the airline's order of 27 of these aircraft, even as the national carrier grapples with glitches in its fleet of 787-800 planes. Once described as a "game-changer," Air India was one of the launch customers of the Boeing 787-800s and had started inducting them in its fleet about four years ago. Since then, the airline has been facing a series of technical glitches and other malfunction issues with regard to the Dreamliner fleet. Boeing's senior vice president sales (Asia Pacific and India) Dinesh Keskar said two Dreamliners would be delivered this year. "The delivery of Dreamliners start in November this year ... It (delivery) is on schedule. First plane in November and the next in December. Four more in 2017," he told PTI in an interview. Air India currently has 21 Boeing 787-800s in the fleet. It has not taken delivery of these planes since May 2015. In January 2006, it had placed orders for 68 Boeing aircraft, including 27 Dreamliners and 41 B-777s and B-737-800s. Occasional glitches have forced Air India to ground these planes multiple times, causing long flight delays and significant loss of revenue. Playing down instances of operational woes faced by some planes, Keskar asserted there was no delay in the delivery schedule for Air India. "You don't hear about it. So they have been taken care of. The aeroplane (Dreamliner) has stabilised. That is the thing now," Keskar said. On whether Boeing was in discussions with no-frills airline SpiceJet for plane orders, Keskar indicated they were in talks. "The answer is very simple. They have already ordered Boeing 737 MAX planes. They have been operating Boeing planes from day one. All they are looking at now is what kind of price Boeing will offer or what benefits Airbus will offer. When the time is right, they will make their decision," he said. B-737 MAX is a narrow-body, single-aisle jetliner series being developed by Boeing as a successor to the B-737 Next Generation series. It is scheduled for first delivery in 2017. Air India, Jet Airways and SpiceJet have Boeing planes in their fleet. Bullish on the Indian aviation market, the US aircraft maker has projected India to see a demand for 1,850 new aircraft worth $265 billion over the next 20 years. As per its annual Current Market Outlook for India, single-aisle airplanes like the next-generation 737 and 737 MAX would make up for the largest share of new deliveries, pegged at 1,560 planes. Keskar said that break-even fares were coming down due to fall in fuel prices. "It is good for the industry as long as you are profitable. Everything is good as long as you are profitable. The moment you go into losses, it is not good. "What is happening today is that the break-even fare is coming down because fuel prices are going down. Break-even fare has come down considerably by 39 per cent over the years" because of low costs due to cheaper oil, he said. Keskar said that benefits of lower fuel prices were being passed on to people and "as long as airlines do that and make money, it is a good thing for the industry." "More people will fly if the fare is low. That is why we are growing... It may not be a sustainable strategy but again if fares go up by 2 or 3 per cent and fuel price goes up by 2 and 3 per cent, that can be sustainable," he noted. As per Boeing, fuel prices, the exchange rate, and load factor continue to drive airline operating costs and profitability. The Boeing Senior Vice President Sales said the new civil aviation policy had many growth-oriented aspects, including regional connectivity scheme and the decision to replace 5/20 overseas flying norm with 0/20 rule. Domestic carriers that have at least 20 planes can now fly abroad while earlier they were also required to have five years of operational experience to operate overseas flights.